174 fans have viewed Eric Clapton tickets today! 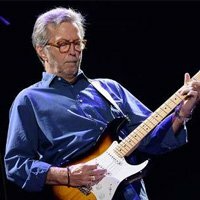 Eric Clapton is an English blues rock singer-songwriter and guitarist from Ripley, Surrey. Starting his music career in 1963, as a member of The Yardbirds, and later Cream, he launched his solo career with a self-titled album in 1970. He has released 23 albums, including ‘461 Ocean Boulevard’ in 1974, ‘Slowhand’ in 1977 and ‘From the Cradle’ in 1994. Eric Clapton will be performing 1 event in Dresden on Monday 10th June 2019 at the Messe Dresden. Scroll down to see all ticket options and prices. If you'd like to see a list of Eric Clapton events, please CLICK HERE. We display the most accurate ticket prices available to us, but Eric Clapton ticket prices can change based on demand & availability. Stereoboard takes no responsibility for any difference in prices, or accuracy, displayed here and those on external sites. Our listings are purely for information purposes only and we are unable to verify any accuracy.